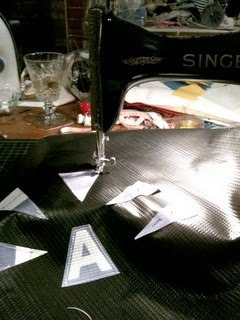 I love love love my new industrial sewing machine! 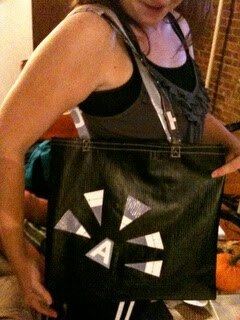 I made this tote bag for my cousin April who was in town this weekend. Its made out of billboard vinyl that I got at work. It is the prototype for the rest of the bags I'm going to make. 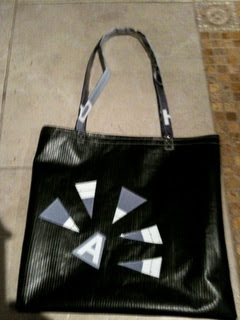 The material is black on the back and a blue and gray and silver car ad on the front so the bags will be those colors. Put in an order if you want one with your initial on it like this one. I think I will sell them for $20 each. They also have a small pocket on the inside for your phone or wallet. These bags are perfect for taking to the market or grocery store. They are waterproof so putting ice and a 6 pack in them is a good idea too! I like these!! A good sturdy bag is something people are always going to need. "tote bad", tamara? made a "tote bad", huh? how's that, uh... how's that "tote bad" workin' out for ya? geex, tamara. geex.